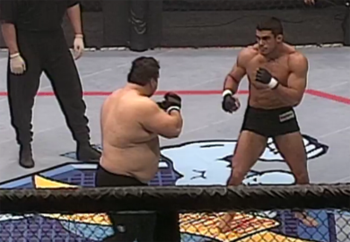 Takahashi out-grapples Ismail early and gives him such a wedgie that the director has to change camera angles. Tanahashi knocks Ismail down with a couple of rights, but he doesn’t get a count from the referee because these aren’t Pancrase rules. The fight slows down against the fence, and the fans get restless. Tanahashi gets an ankle pick and takes top position, landing headbutts and short punches. Time expires at 12 minutes, so we go to overtime. Ismail looks like he does not want to keep fighting, as he is gassed. Tanahashi doesn’t do much in the extra three minutes and the fans boo them both out of the building. The judges write “Tanahashi” on their white boards, so it’s a unanimous decision for him. Ferrozzo is coming off the biggest win of his career over Tank Abbott at UFC 11. Mullen says he has already seen himself winning 10 times in hypnotherapy. OK then! Mullen is a pro boxer and kickboxer, so he’ll be striking. Ferrozzo wants to shut Mullen up, and he also doesn’t want to get hit in the face. He wants to end it quickly. Ferrozzo is 323 pounds; Mullen weighs 215. Tank Abbott is on commentary and admits Ferrozzo was the better man last time. Abbott calls Ferrozzo a WWF wannabe, even though Abbott himself later ended up in WCW. Ferrozzo squashes Mullen against the fence and lands some knees and punches. Ferrozzo continues the “smother and brawl” strategy. Mullen can’t get anything going because it’s like he has a piano on his chest. Referee John McCarthy stops the fight and calls for the doctor, as Mullen’s left eye is banged up. After the restart, Mullen tries a spinning backfist, but it doesn’t work. Ferrozzo delivers some huge knees to the face, and McCarthy stops the fight at 8:17. Telligman says one mistake can cause a fighter to be forgotten. The Texan is missing a pectoral muscle due to a childhood injury. Belfort is from Brazil; he’s only 19, and Beck correctly predicts that he could turn out to be one of the greats. Belfort displays lightning hands and knocks Telligman down. Belfort passes Tra’s guard and takes side control. Belfort clobbers Telligman with punches and elbows, and referee McCarthy decides Telligman has had enough. We see footage of Coleman working out, and he talks about how he missed competing at Ultimate Ultimate 96 due to a virus after winning UFC 10 and 11. He says he’s going to try to rough up Severn with punches. Joe Rogan tells us Tanahashi broke his hand and can’t compete in the finals of the lightweight tournament. He will be replaced by Nick Sanzo, who won an alternate fight in 47 seconds. Sanzo is from Niskayuna, N.Y. and at 34 years old, he’s 12 years older than Bohlander. We start with a grappling battle, and Bohlander lands some knee strikes. Bohlander slaps on a crucifix choke (like a reverse full nelson) and wins the tournament final in 35 seconds. Rogan is with Belfort’s teammates, one of whom compares Belfort to Tiger Woods and Michael Jordan. No pressure. Ferrozzo is 13 years older than Belfort and outweighs him by 118 pounds. Beck says Ferrozzo has something to prove here because he was not invited to Ultimate Ultimate 96. Belfort blitzes Ferrozzo with a couple of punches. He takes Ferrozzo’s back and blasts him in the face from behind. After a few follow-up shots, McCarthy stops it at 52 seconds. Ferrozzo gets up and wants to keep fighting, but it’s already over. Vitor Belfort and his blazing punches have arrived. Coleman is undefeated and burst onto the scene with a decisive win over Don Frye at UFC 10. He won UFC 11 as well. Severn has won UFC 5 and Ultimate Ultimate 95. He hasn’t fought since his snoozer with Ken Shamrock at UFC 9 to win the Superfight championship. Severn tells McCarthy a wacky “math word problem” joke before the fight. Coleman stuffs a pair of takedown attempts by Severn. Coleman grinds away with a headlock. Severn tries some short punches, but Coleman continues crushing his opponent’s head and Severn taps out at around the 3-minute mark. Coleman is still undefeated, and he says nobody can keep him down. He wants respect and says he’s willing to face Frye in a rematch. Coleman is the first UFC heavyweight champion, and we are out!